This installation is made out of over five tons of plastic waste, floating on the surface of the pacific ocean. The whale was chosen to underline the colossal nature of the problem - 150 million tons of plastic waste still remains out in our oceans. Not another plastic whale picture?!? This is a "Wow", Ayush. Plastics are so impossible... you absolutely cannot live in the modern world without encountering plastic in almost everything you do. And disappointingly - most of the plastics we use cannot, actually, be recycled. Jolie photo et magnifique sculpture qui émerge de l'eau. This thing is making an important point Ayush. Well taken! We saw it from the water, Ayush, and were appalled by what it stood for. (sigh) Thanks for drawing attention to the tragedy. That is a clever sculpture designed to awaken awareness of the problem Ayush. wow! at the whale, and the message! 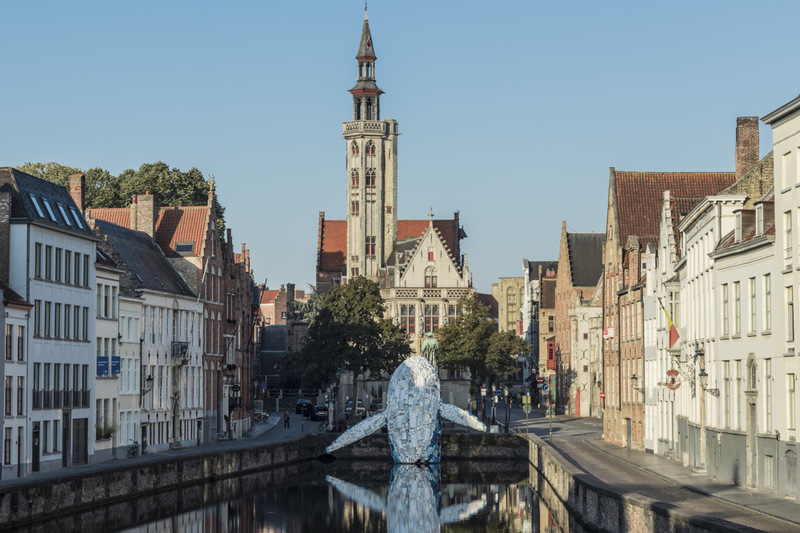 I appreciate the meaning of the Whale but somehow it looks really out of place in the centre of lovely Bruges. Our whole province is about to ban single use plastic. I like the image too. Brings back a lot of memories for me. For instance the nice coffee shop down the road to the left. Its a stark reminder Ayush.You captured it well.